In church recently, I had a rude awakening. And that rude awakening was that I am freaking luddite. Or, more accurately, I’m too poor to afford technology. This realization was reached when we were singing a hymn at church. There I was sitting in a meeting singing along, when I look over and a friend of mine was reading the words of the hymn off a device that looked like it came straight from Star Trek: The Next Generation. Only, instead of being held by some space alien, it was being held by a normal man in priesthood meeting. And instead of being some kind of shooting mechanism that could kill aliens and ugly-looking rodents if they got too close, it was basically a hymnal. A hymnal worth a MILLION DOLLARS. Guys, do you want to know what year I’m stuck in? Remind me why I use my blog as some kind of ignominious confessional again? The really sad thing? There’s a part of me–a very, very small part of me–who still thinks I’m kind of cool when I whip that thing out. And then I remember that I’m half-a-decade too late to be cool, and that today’s technology is so advanced that by the time I catch up I’ll be doomed to own 2015’s equivalent of the Razr, and that I basically look like the kid who got the regular Nintendo Entertainment System several years after everyone had upgraded to the Super-Nintendo but didn’t realize how behind he was and didn’t understand why nobody showed up when he invited friends over to play Duck Hunt. My husband happens to think he is pretty cool for having said hymn book (assuming you are talking about him…but seeing as though he is the only one I see flaunting it about in church, I'm going to guess you are) – I think you should be making fun of him and his "look at me I'm awesome" attitude 🙂 I do it ALL the time! Oh – and no worries the only video gaming system in our house is a nice Super Nintendo as well – we can take you on with duck hunt! If only we could be as cool as other people! Be glad you don't have to live with such a cool person – it's hard sometimes! We should totally have a Duck Hunt party. But then someone would probably show up with their cool device and their "Duck Hunt app" and ruin it all. Maybe you're behind the trends, or maybe you're just really far ahead of a retro trend. Consider how awesome it would be if you whipped out a Zack Morris phone at work today. Your Razr will eventually be a great conversation starter. Fun Fact: a second player can control the duck from a controller in port 2 when playing in one duck mode. However, I would say that you would be infinitely cooler if your Razr was pink. Just sayin'. I think Razrs are cool . . . I am lucky enough to own a pink Razr. It was a hand me down from my mother-in-law. That's right. My mother-in-law is more technologically advanced than I am. How does that work? So…my first "cool" phone was a black Razr. That thing cost $200 at the time! RIDICULOUS. Now my Android phone is practically a God compared to my poor, old Razr. I am happy to say that my favorite video game EVER is an NES game though. Care to challenge me to a round of Dr. Mario??? Ha ha. hi- just joined your site! i just played on my original nintendo the other night. contra pwns. I had a pink Razr! I LOVED that phone and totally felt cool whipping that thing open every time I got a phone call. In fact I was desperately searching for it today after my cool G1 with Google finally bit the dust this morning. I wouldn't have cared so much, but my husband and I did away with the house phone when we realized we never used anything other than our cell phones. And that wouldn't have mattered, but then I imagined the school frantically trying to get a hold of me, to no avail, if one of my children were to get sick, hurt or expelled. Sadly, I never did find my awesome pink Razr and thankfully no one needed to get a hold of me! You have me beat by 6 years. About 4 weeks ago I entered the world of cell phone users prior to that didn't have one but I just added a Blackberry to the family (no holding holster though, nor am I sure how it really works). I was cut off at the Atari and never even had the original NES. @Ashlee–Indeed it was your husband who had the newfangled technology, and indeed it makes me quite intimidated to be around cool people like that–mostly because I wish I was cool too. This is just a hunch to make myself feel better: I'm pretty sure I can beat him at Duck Hunt. But I'm kind of scared to test that hypothesis because if he wins AND has a million dollar hymnal I'm pretty sure I won't have any self esteem left. @jjstringham–You're exactly right on both counts–we should have a Duck Hunt party and somebody would ruin it with a cool "application." Pretty rude. @Brad–Genius!! I'm just retro! It's all intentional you know. It's not that I can't afford stuff. It's that I'm that cool that I'm predicting retro trends of the future. Perfect! @Party of Four– Fun fact: you knowing that makes you the nerdiest person I know as well as the most awesome person I know. Quite the factoid, that. @The Golden Eagle–Thanks for the moral support! @Amanda–My MIL is way more technologically advanced than I am too. Very shameful. Very, very shameful. It helps that she's awesome. @Christine–BRING IT. I love Dr. Mario! And when I say "bring it" I actually mean come on over to The Weed's house and bring it because I really want to play it. @You're Lucky I Don't Have a Gun–First I'll take your word for the fact that I'm lucky you don't have a gun. Second, that name corresponds perfectly with Contra, which game was AMAZING. Thanks for following! @Regina–your comment is riddled with tragedy. First, I'm sorry about the loss of your G1. Second, I'm sorry about the loss of your old friend, the pink Razr. I'm happy to hear that in the end nobody got sick hurt or expelled! @Darin–You would have officially made me feel better about myself except that buying a Blackberry cancels out the six years I had on you entirely and also puts you 1.5 years ahead of me. (Will I ever win at this game?) Also, NO NES?! So many amazing games. You've gotta get one on ebay. I never did the Atari, but I remember my dad borrowed one when I was really little. I thought it was freaking amazing. In closing on the longest response comment ever: I work at a school district and can't comment on blogs, so I end up waiting all day and then having to do one of these behemoth responses which is probably so daunting to look at nobody actually reads them. But I do get your comments on email and start formulating my response in my head and then click to write down the response and instead see the Kent School District Block Page over and over again if that counts for anything. But really, thanks guys. Also, I'm pretty sure this should count as a post. Not proofreading! I live on the edge! I have had the same phone since 2005. The up and down buttons stopped working and I still kept using it. I couldn't access my phone book or text and I still kept using it. Today I finally got a new phone – no, not a smart phone, no touch screen or internet…I got the same phone, but the newer model of it. I think your razor is cooler than both the phone I had and the phone I bought today. So you can rest assured knowing that your piece of technology is cooler than mine, at the very least. @Ashley–Wow, you did it! I'm not tied. I haven't been blown out of the water. Compared to you I actually WIN the technology game! Thank you so much for giving me this glimmer of hope in an overwhelming world of shiny, downloading, app-buying, smart phony craziness. I wrote an extensive comment on how techno-savy I am, and then it got deleted when I tried to switch google accounts. I no longer have any opinions on anything related to the current topic. Weed, rest easy. My husband is a super enginerd and techy but he loves his razyr and went to great lengths to find one when his last phone died. I on the other hand just got my early christmas gift of a new LG Quantum Windows7 phone and it leaves his phone in the dust…but he still loves his razyr….so there are plenty of people out there …you are not alone. 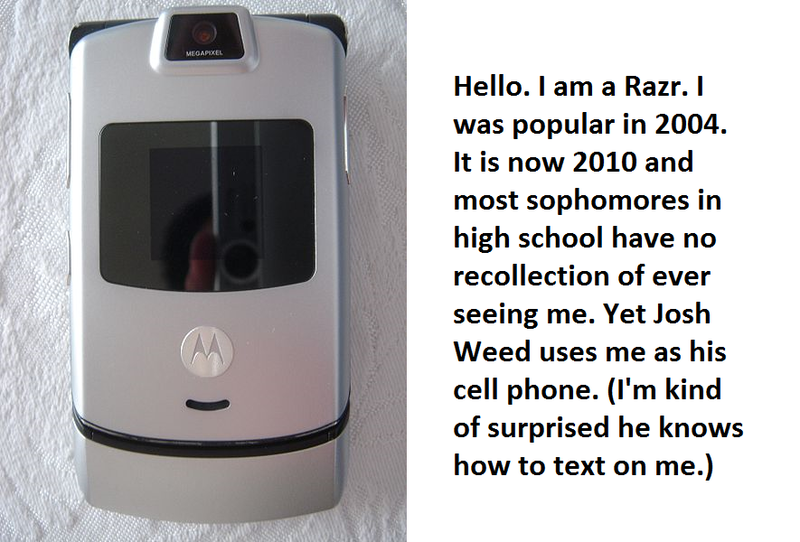 I had a razr up until last month…and it WAS still cool. That's what I tell myself anyway. My cell phone was only updated because Verizon told me that 911 wouldn't be able to find me on it, but I do have an iPad and any wonderful things you've heard about it are completely true and then some. I LOVE it.